Restarting your device is a simple step that can alleviate a lot of frustration and take care of many issues. It should be the first step taken in troubleshooting any issues. Hold down the Sleep/Wake button on the top of the device until you receive a slide bar at the top of the screen. Sliding this will shut down the iPad. After about 20 seconds you can power on the device by holding the Sleep/Wake button down again. A hard reset can be performed by holding down the Sleep/Wake button and Home button until the device resets. When you see the white Apple logo you can let go of the buttons. Parental Restrictions in place can lead to a variety of unique issues. For example, if Safari or the Camera are disabled they will no longer show up as options for a student to select. This is a great place to look if there are strange issues impeding normal function. 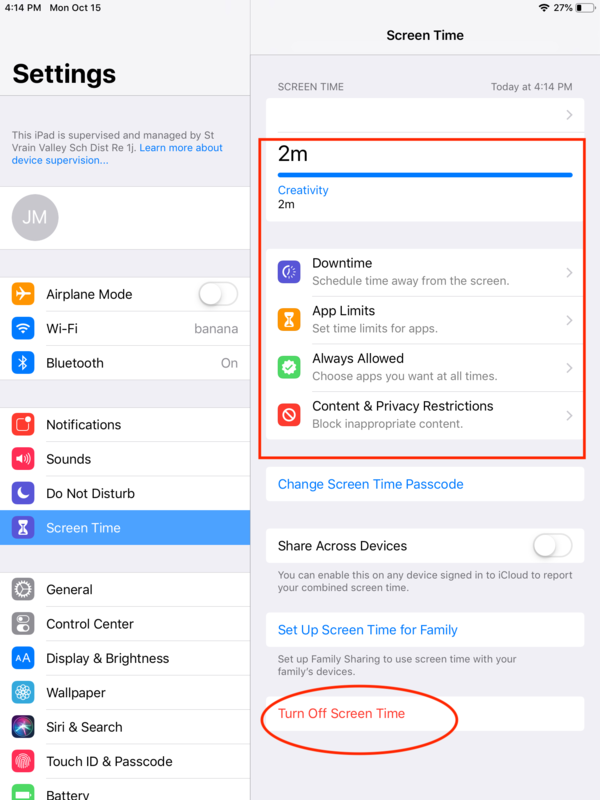 To find out if restrictions are in place go to Settings > Screen Time. 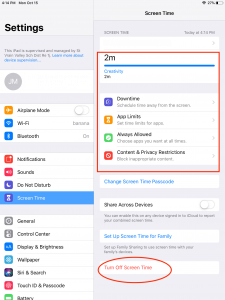 If Screen Time is enabled you will see a view similar to the one below, with a “Turn Off Screen Time” button at the bottom. If restrictions are enabled, the parent must be contacted to find out which restrictions are in place and why. Some restrictions will interfere with access to digital curriculum. Click here to learn more. Sometimes an application may show as installed but it just does not function properly. 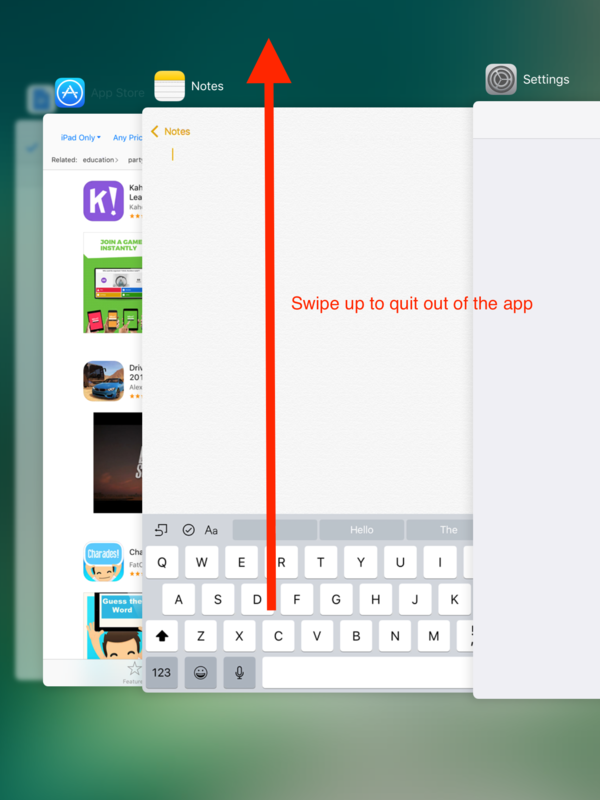 When this happens it can help to reinstall the application. 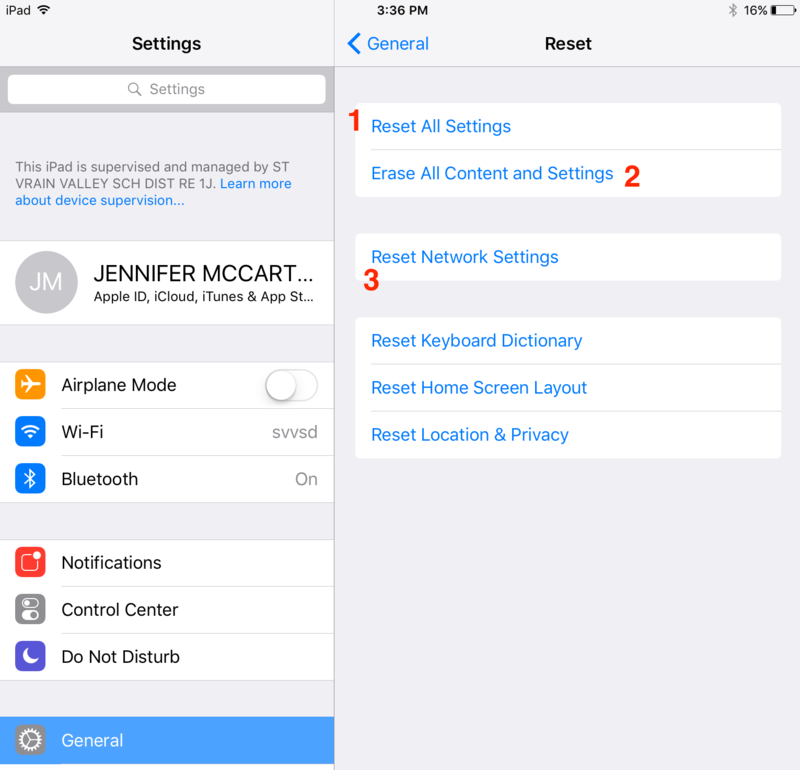 Within iOS there are a few resets that can be utilized to troubleshoot different issues. These can be found under Settings > General > Reset. Some of these resets will require the “Restrictions” passcode in order to complete. If “Parental Restrictions” have been implemented and the device has to be reset to factory settings, the parents of the student will need to be notified to re-instate them. Reset All Settings resets all device settings, but will leave installed Applications/Profiles intact. Erase All Content and Settings will reset the device to factory defaults, removing all settings and applications installed on the device. This is a complete reset and will need to go through standard setup steps again for it to be used in the district. Only use this if there is no other option or other options have not worked. Reset Network Settings will reset all settings related to connecting to the network. This is helpful if there are issues staying connected to the WiFi, or other network related issues. 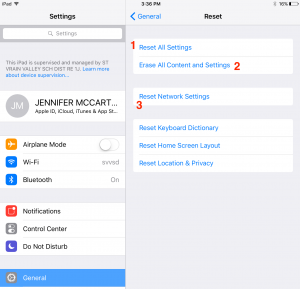 If you are unable to access the device settings you can put the iPad into Recovery Mode. This will allow you to reset the device to factory.